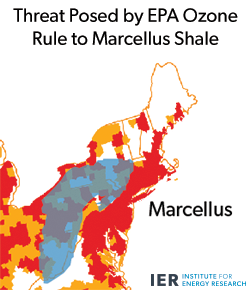 EPA’s ozone limits would likely restrict natural gas production in key shale gas regions. Yet using more natural gas is a crucial “building block” of the EPA’s CO2 rule—EPA Administrator Gina McCarthy has even called natural gas a “game changer” in this regard. If using more natural gas were off the table due to new ozone limits, many states would likely find it more difficult and expensive to comply with EPA’s CO2 regulation. The bottom line: EPA’s regulatory agenda contradicts itself while imposing enormous economic costs on Americans, all while air quality continues to improve without further federal intervention. For these reasons, EPA should withdraw its ozone and carbon dioxide rules. Below is a map of area NAM predicts would be deemed in nonattainment under a 65 ppb ozone standard. As the map shows, large swaths of almost every shale gas formation, including six out of the top seven plays, could fall into nonattainment under EPA’s proposed ozone rule. Those six shale formations—the Marcellus, Eagle Ford, Haynesville, Permian Basin, Niobrara, and Utica—accounted for close to 100 percent of domestic natural gas production growth over the last three years. If EPA’s ozone rule curtails natural gas production in these key shale areas, it could complicate compliance with EPA’s so-called “Clean Power Plan.” EPA has proposed cutting carbon dioxide levels by 30 percent by 2030. One of the four “building blocks” on which EPA’s CO2 rule rests is shuttering coal-fired power plants and replacing them with gas-fired plants. This fuel switching, and being able to do it without dramatically higher electricity and natural gas prices, depends on our ability to continue producing large amounts of natural gas from shale formations—many of which are threatened with “nonattainment” under EPA’s ozone rule. 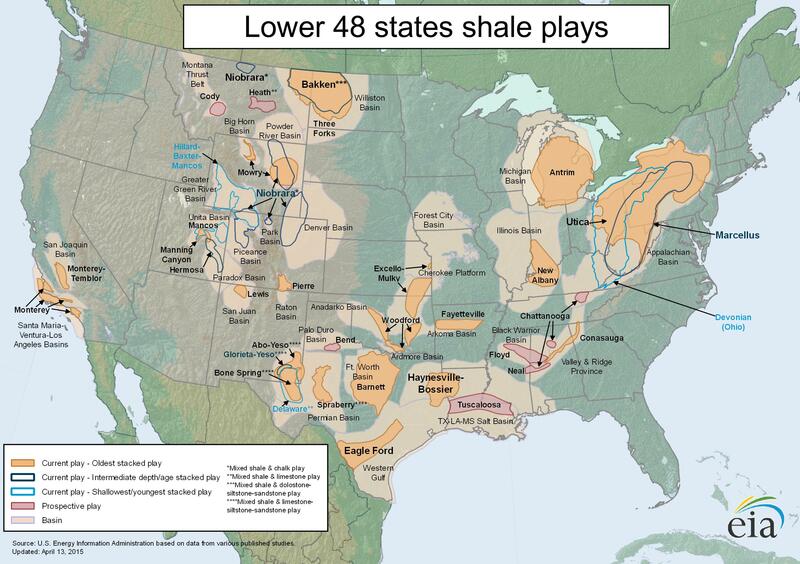 The same is true for the other shale plays above, including Colorado’s Niobrara, Texas’ Permian Basin and Eagle Ford, Louisiana’s Haynesville, and Ohio’s Utica. Most of Colorado’s natural gas output, for instance, is concentrated in the northern Front Range, much of which NAM expects to receive a nonattainment designation under a 65 ppb ozone standard. That could jeopardize Colorado’s thriving energy industry, whose dramatic growth has made the state the sixth largest natural gas producer. It’s worth noting that EPA is also clamping down on methane emissions, which could also curtail natural gas production. If less affordable natural gas is available, compliance costs for EPA’s CO2 rule would likely skyrocket. EPA talks about using renewables like wind and solar, but these sources are not substitutes for natural gas because wind and solar cannot be counted upon to produce electricity when it is needed. The other building blocks—heat-rate improvements at coal plants and energy efficiency mandates—can only go so far. Without natural gas as a “game changer,” states’ options for compliance will be significantly more limited and costly. EPA’s regulatory agenda has become so expansive that the agency’s own rules conflict with one another. EPA’s ozone rule undermines the foundation of EPA’s CO2 rule. While EPA’s CO2 rule drives the use of more natural gas at the expense of coal, the agency’s ozone rule could restrict natural gas output in key shale formations right when states need more natural gas to comply with the CO2 rule. EPA could simply exempt shale-producing regions from its ozone rule, but that fails to address the more fundamental problem: EPA’s out-of-control agenda. EPA’s regulations impose huge costs for small benefits. The agency’s ozone rule could be the single costliest regulation in U.S. history, even though ozone emissions have declined 33 percent since 1980. Meanwhile, EPA’s CO2 rule will impose double-digit electricity rate hikes for residents of 43 states, but limit global warming by just 0.02 degrees Celsius. The solution is for EPA to withdraw its proposed ozone and CO2 rules. This post originally appeared on the Institute for Energy Research blog.